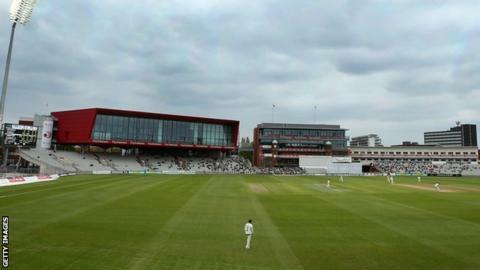 Lancashire and Sussex had to settle for a draw following persistent rain on the last day at Old Trafford. The visitors declared on their overnight total of 215-6, setting the Red Rose a winning target of 324. But only 8.4 overs were bowled on the final morning before bad weather forced the players off, Lancashire having reached 19-0. The match was called off at 15:30 BST following several unsuccessful attempts to return to the field. Sussex have now won two and drawn one of their opening four fixtures, while Lancashire have one win and a draw to their name from four games. "Ultimately the weather was the winner in Manchester, much to Sussex's frustration having dominated this match for three days. "Sussex have responded well to the heavy defeat by Somerset last week, and even without skipper Ed Joyce and Chris Jordan have looked a side capable of mounting a challenge for the Championship. "The return from injury of the experienced Chris Nash and Luke Wright, together with welcome runs for Mike Yardy, Rory Hamilton-Brown, and Matt Machan augers well for Sussex, with County Champions Durham due at Hove on Sunday." "Today had the making of a cracking game, it was set up nicely. "If we'd have batted for two sessions and got into a decent position at tea we'd have had a chance of going for the win. "Overall Sussex have had the better of the game, we don't deny that in any way and we fell horribly short in the first innings and that put us on the back foot. "We're just not scoring enough runs and the batsmen are addressing it but I don't think it's due to a lack of skill. We are working really hard to come good for the next game."